The theme was "pockets and envelopes." A triangular pocket houses a circular quote about the round earth which forms a triangular closure. 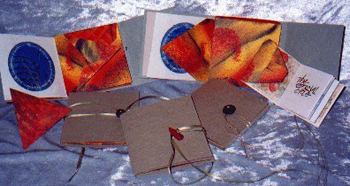 The centerfold is closed to form an envelope which houses a small book, which contains a quote about each of the four seasons. A gate fold hides a Ruskin quote about lilies and peacocks. This small edition of 15 was inkjet printed from scans of calligraphy, acrylic paste-painting, pastels, and handmade rubber stamps. A sub-edition of 3 was done by hand, with the original paste-papers and calligraphy. Closures included beads, drilled rocks and handmade paper "buttons (see right-hand photo)."